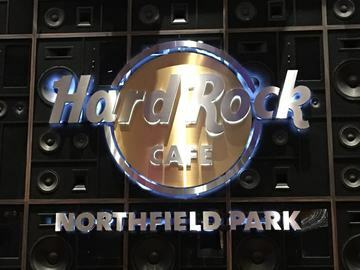 Hard Rock Cafe Northfield Park is the centerpiece of the first-of-its-kind Hard Rock Rocksino Northfield Park, which offers fantastic dining, gaming, entertainment, and legendary music memorabilia in an authentic rock atmosphere. Northfield Park is Ohio's premier harness racetrack and is located between the Rock-n-Roll Hall of Fame in Cleveland and the Pro Football Hall of Fame in Canton. With the addition of the Rocksino, Hard Rock Cafe Northfield Park is sure to become a Hall of Fame in its own right. Enjoy classic American cuisine from our menu – including the Legendary Burger, fresh salads, and delectable desserts – while surrounded by music history. Memorabilia from Elvis, Eddie Van Halen, The Jackson 5, Aerosmith, and more adorn the walls of our cafe. You can see it all with just a touch on our Rock Wall Solo, which gives you quick access to Hard Rock memorabilia and the chance to vote on cafe soundtrack tunes. Great food and drinks aren’t all that our Northfield cafe has to offer; you can also experience live music on our exciting elevated stage. Please note that all guests must be 21 or older at this location.